SAN FRANCISCO—California’s dozens of scenic wine regions offer an exceptional variety of experiences and wines to enjoy. To help visitors explore them all, Wine Institute’s California Wines Road Trips series highlights a different region each month. 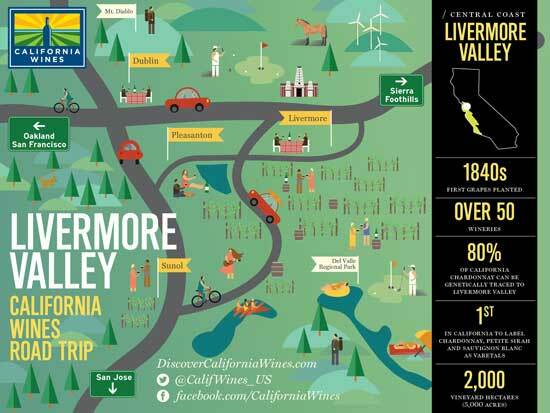 For May, take a trip into California history in Livermore Valley, where Robert Livermore planted the valley’s first winegrapes in the 1840s. One of California’s oldest wine regions, Livermore Valley is enjoying a renaissance with a flourish of vineyards, wineries and experiences. Located within the San Francisco Bay American Viticultural Area (AVA), Livermore Valley is a hidden gem region just 30 miles east of San Francisco. As the only California wine region accessible by the Bay Area Rapid Transit system (BART), it’s easy to access no matter where you are in the area. Both the Livermore Valley and San Francisco Bay AVAs are within the larger Central Coast appellation. SIP: The Livermore Valley wine region is home to more than 50 wineries. Browse this list of Livermore Valley wineries or use the discovercaliforniawines.com interactive map to search wineries by amenities such as tours, gardens, picnic areas, food for purchase and more. The Livermore Valley Winegrowers Association also lists wineries, events and even a helpful selection of pre-planned visit itineraries. Want to bring your furry best friend? About half of Livermore’s wineries welcome dogs; you can sort this winery list to find dog-friendly options. STAY: Located just 45 minutes from Silicon Valley or San Francisco, Livermore Valley offers a range of accommodations from countryside resorts to boutique downtown hotels, some of which are even served by BART. Use this list to find your perfect lodging option. PLAY: One of the most convenient and fun ways to experience Livermore Valley is on the Livermore Wine Trolley, which offers group and private tours of the region. The six-hour group tour stops at four wineries and provides lunch for only $99 per person. Like to mix the great outdoors with your Chardonnay? Wine tasters visiting Livermore Valley have a range of options, including a huge network of scenic bike and hiking trails with views ranging from vineyards to coastal mountains. It is possible to visit at least 16 Livermore Valley wineries using more than eight miles of multi-use trails and bike lanes. Learn about sustainable gardens on the Livermore Valley Drought Resistant Garden Trail, which offers six winery locations that feature beautiful native plantings to complement their beautiful wines. Cap your evening by taking in a music, dance, theater or film performance at the Livermore Performing Arts Center. MAKE: Uncork your inner winemaker at The Winemakers Studio at Wente Vineyards, where you’ll get hands-on with several signature experiences including a blending class, wine aroma discovery, and wine and cheese pairing seminar. At Concannon Vineyard, groups of 12 or more can enjoy a friendly competition to see which team’s custom red blend takes the prize at The Art of Blending. See tours and tastings at the website. GROW: Surrounded by coastal range mountains and foothills, the Livermore Valley has an east-west orientation, making it unique among northern California winegrowing regions. This feature allows the coastal fog and marine breezes to come in from the Pacific Ocean and the San Francisco Bay and cool the valley's warm air, resulting in warm days and cool nights, ideal conditions for producing fully-ripened, balanced fruit. Pioneer Livermore winemakers C. H. Wente and James Concannon planted their vineyards in the early 1880s, having recognized the area’s winegrowing potential. Today, both wineries continue to thrive and have celebrated more than 130 consecutive harvests. California winegrowing owes a great deal to Wente and Concannon’s early grapevine plantings: most California Chardonnay can be genetically traced to the Wente Chardonnay clones and 80 percent of California Cabernet Sauvignon can be traced to a Concannon clone. Fun fact: Livermore Valley was also the first region in California to label Chardonnay, Sauvignon Blanc and Petite Sirah as varietal wines. EAT: Visit July 21-24 to enjoy Livermore Valley’s premier food and wine affair, Taste Our Terroir. The event opens with 19 Livermore Valley wineries partnering with Bay Area restaurants to compete for honors such as best classic pairing and the coveted People’s Choice Award. The remaining days will offer a variety of cooking classes, vineyard tours and seminars. While Livermore has a number of dining options, you can also enjoy a meal at some wineries, including The Restaurant at Wente Vineyards. Visit discovercaliforniawines.com for information on wine regions, wines and wineries throughout the Golden State and for planning a trip to California wine country. California is the number one U.S. state for wine and food tourism with dozens of distinct wine regions, 138 American Viticultural Areas and 4,400 wineries that produce 85 percent of U.S. wine. Established in 1934, Wine Institute is the public policy association of nearly 1,000 California wineries. See: wineinstitute.org.